Cherry blossoms have always been associated with a new, fresh start, since they announce the arrival of spring every year, filling the surroundings with their breathtaking scent and delicacy. Despite their simplicity, they triumph among many other beautiful flowers and it’s not in vain that many cake artists give preference to these lovely little flowers when decorating a cake in a romantic style. 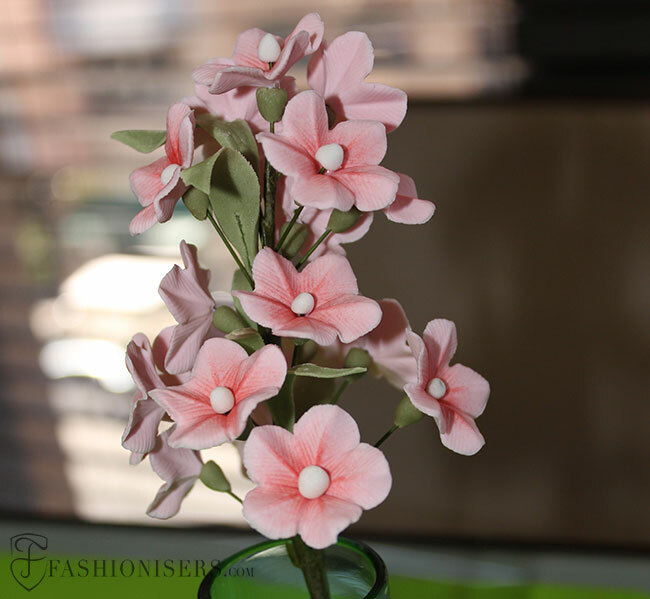 Their dreamy petals featuring a soft pink hue can be irreplaceable decorative elements especially for a wedding cake or one designed for a girl’s birthday, for instance. 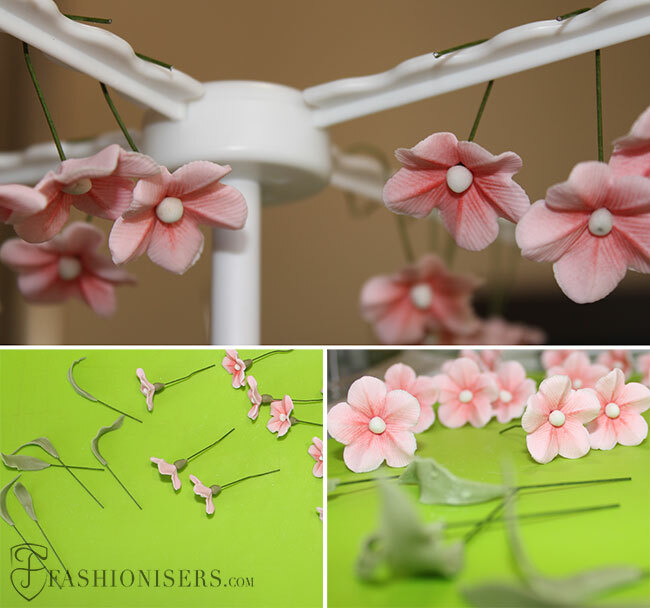 Today, we want to present you an easy gumpaste cherry blossom flowers tutorial, following which even beginners can manage coming up with realistic tiny flowers that will take their simple cakes to a whole new artistic level! The most important ingredient here is surely the gum paste. You can get it in any cake-decorating store or supermarket, however, if you prefer making it on your own, stick to the recipe presented below. Put the egg white and the liquid glucose into a bow. You need to use a warm spoon for the glucose. Start sifting the icing sugar into the bowl little by little, stirring the mixture until getting a thick paste. Dust the table with icing sugar and put the ready mixture on it. Start kneading the paste until getting a soft and smooth texture. If it turns out to be slightly dry, fold in a little vegetable oil and knead the paste again. If the paste turns out to be very soft, you need to add a bit more of the icing sugar. Store the paste in a food-grade polythene bag in a cool place at room temperature. Before using it, you need to knead it. Step 1: If you have a ready pink gumpaste, you need to start rolling it out. However, if it’s white, you need to add a few drops of the edible coloring into it and knead it until getting a smoothly colored paste. 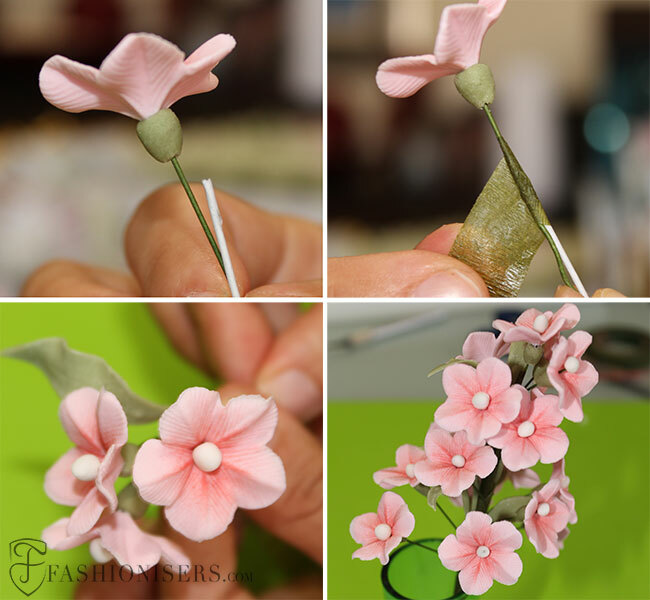 Roll out the paste to a minimum thickness, since the flower petals are very delicate and the ones made of a thicker paste will look unrealistic. 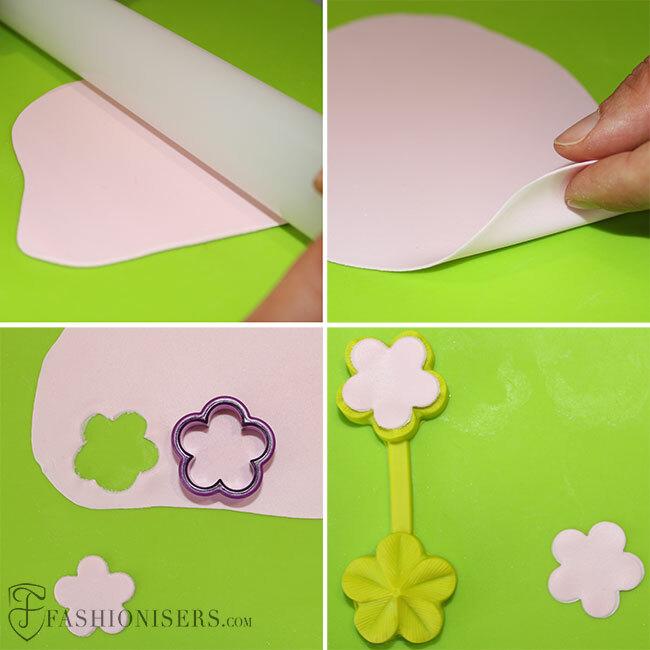 Step 2: Using the flower shape cutter cut out several flowers. 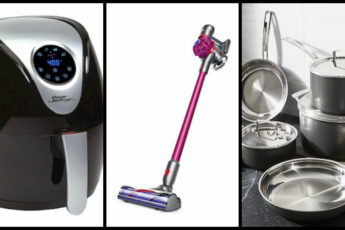 If you don’t have one, you can do it using a sharp knife. Step 3: If you don’t have a flower 3D mould, you need to use the cone modelling tool to slightly ruffle the edges of the flower petals and then the leaf shaping modelling tool to give texture to the petals. 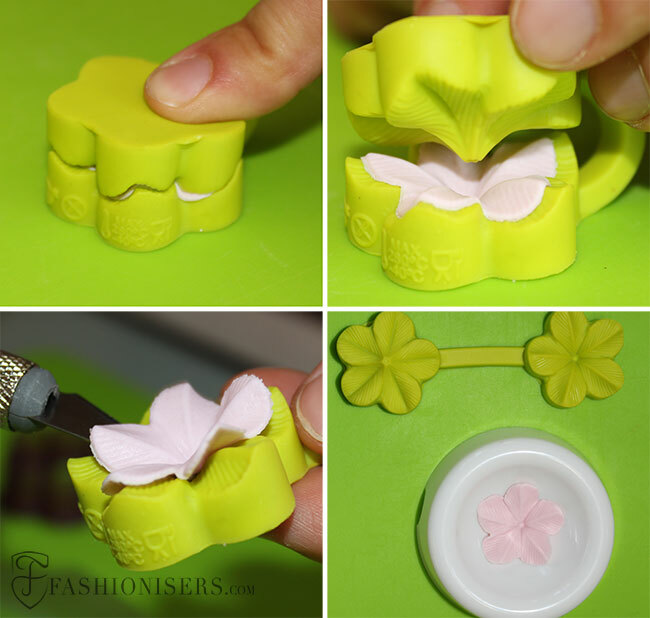 However, if you have the flower 3D mould, simply place the flower into it, close it with the second end and gently press it, giving the ideal texture to the petals. Gently take out the flowers from the mould. 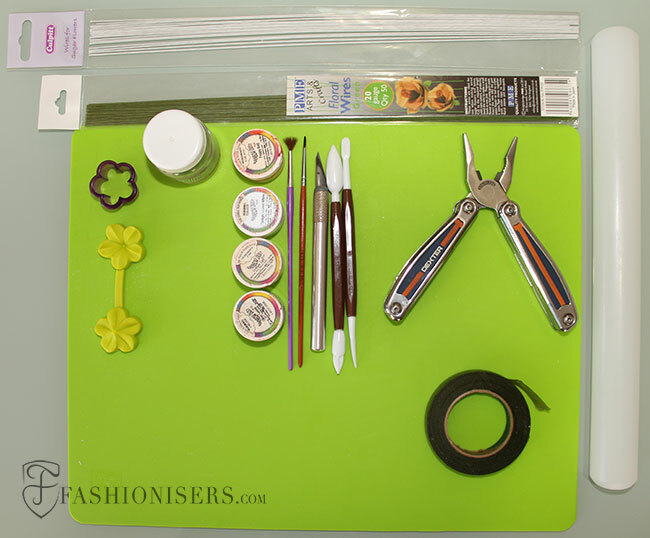 Step 4: Cut the green floral wires, take one and fold the tip of it with pliers. You then need to dip the folded tip into the edible glue. 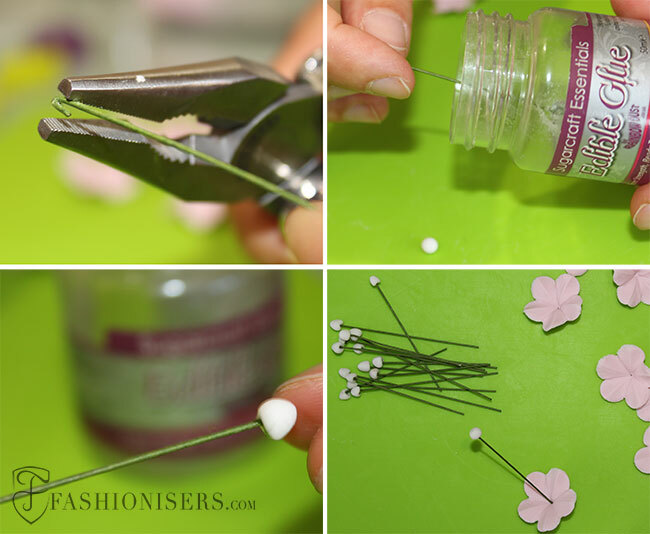 Make tiny dots from a white modelling paste and stick them to the folded tip of the floral wire. 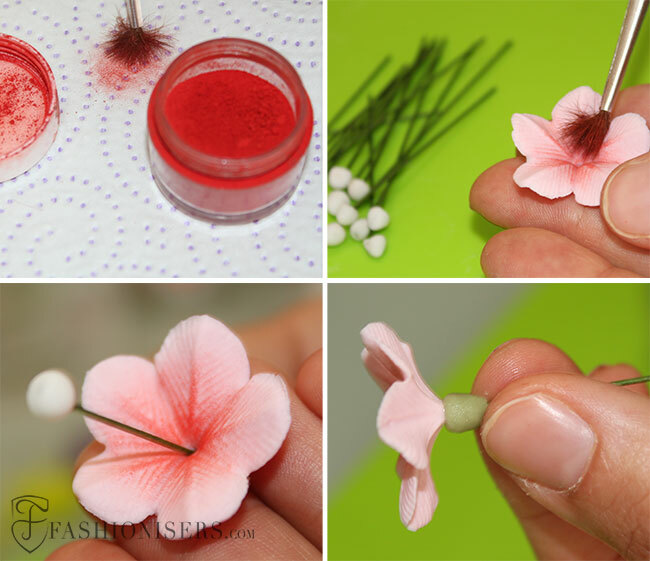 Step 5: Take an edible red powder coloring and slightly dust the inner part of the flowers using a paintbrush. After this, you need to insert the green wire with the white dot attached to one of its end into the flower the way that the white dot appears in the center of the flower. Last but not least, make a small dot from a green gum paste and insert it into the same wire so that it stick to the back of the flower. You need to leave the flowers to dry out at room temperature, which may last a couple of days. Step 6: Now, you need to make tiny leaves from a green gum paste. Again first you need to roll it out, and then cut out leaf shapes from it with a sharp knife. You can also use a leaf shape cutter, if you have one. Attach a green wire to its end and put it on a wavy flower former set letting it dry out. Step 7: As your flowers and leaves are all ready, you need to gather them together into a bunch. Take the white floral wire, hold it a bit below the green floral wire with a flower on it and attach them together with a green paper floristry tape. Next place another flower at a bit lower level and continue attaching it to the white wire with the same floristry tape. This way, you need to attach all the flowers and leaves to each other in a random order, getting a bunch of cherry blossom flowers. Last but not least, you can apply your bunch of cherry blossom flowers to your cake, transferring it into a real piece of art. 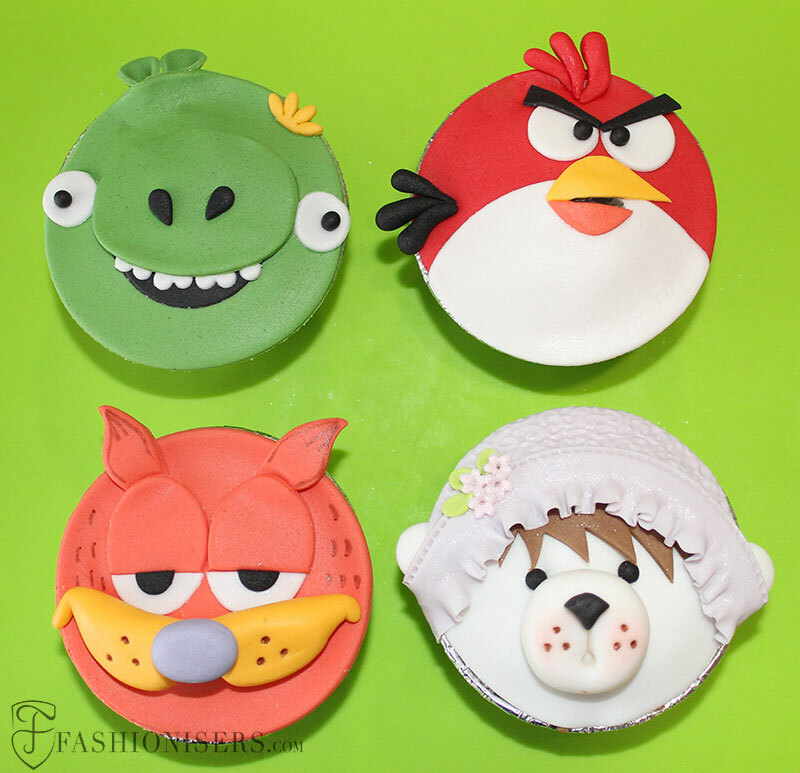 With a few easy steps, you have managed to add a magic touch to your cake, turning it into a memorable sweet treat! Juices VS Smoothies: Which Drink Is 'Healthier'?